Desk pad or wall calendar. Reinforced backing card holds each sheet. One month on each sheet, one lined block per day. Note: A minimum quantity of 120 must be ordered, and in units of 20 thereafter. 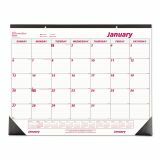 Brownline Monthly Deskpad Calendar, Chipboard, 22 x 17, 2019 - Desk/wall calendar offers easy-to-read, monthly references. Planning pages range 12 months from January to December. One-page-per-month format includes ruled daily blocks, Sunday-through-Saturday scheduling, holidays, count of days/days remaining, moon phases and two past, one current, and 11 future months reference at the bottom of the sheet. The current reference month is bolded for easy identification. Tear-off calendar sheets are bound at the top. Calendar pad has a reinforced backing card, two black corners and two eyelets at the top for hanging. Planner is printed in English. Sheets made of virgin paper.